Who Should Attend?Sports coaches, trainers, athletes & parents who want to be able to treat minor sports injuries and administer Emergency First Aid care. Minimum age 15. This half day course covers a comprehensive range of topics to prepare participants to administer Emergency First Aid care. Participants will learn a high level of practical skill so that they can deal competently with first aid situations that may arise. VenueThe venue is a matted martial arts training centre. Attendees should wear flat shoes, no heels. 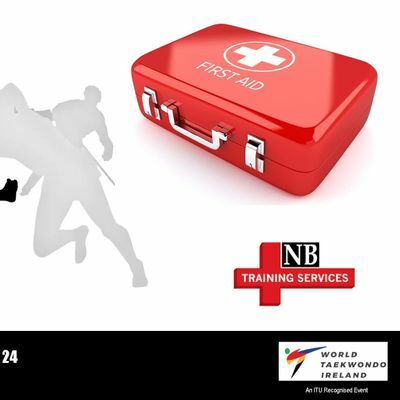 Validation:On Successful Completion, course participants are issued with a First Aid Certificate from training providers NB First Aid. All Instructors hold current certification from the Occupational First Aid Assessment Agent and are listed on their register maintained there on behalf of the Health and Safety Authority. 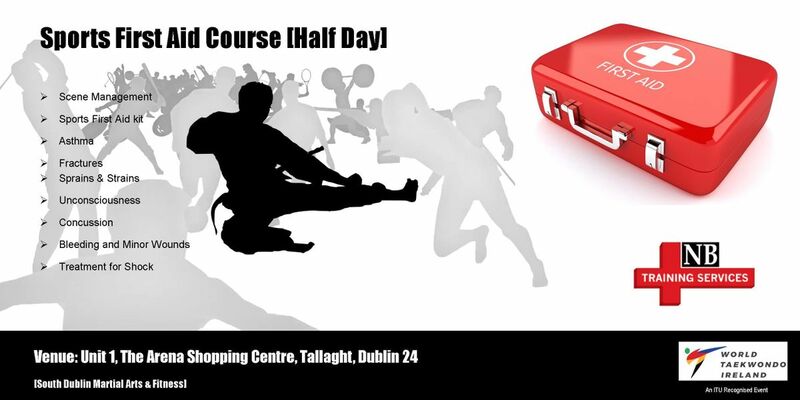 The hosts South Dublin Taekwondo reserve the right to merge Course 1 & Course 2 if required. 15 years. Thise lucky enough to look younger than 15 should have ID. The Arena Shopping Centre has free carparking for 4 hours which will cover the duration of the event. Thise using public transport can get the Luas or Bus to the Square Shopping Mall which is across the road. Please bring a printed ticket or Barcode on Eventbrite App to the event. Yes, but please inform organisers so the Name can be correct for certification.